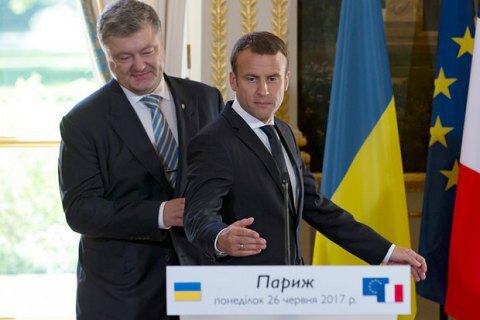 French President Emmanuel Macron presented to President of Ukraine Petro Poroshenko his plan for de-occupation of Donbas, Macron said Monday in Paris at a joint press conference with Ukrainian President P. Poroshenko, who is on working visit to France. "We are waiting for the result. The decision that I offered to President Poroshenko, to all sides of the Normandy format and, in fact, I already did it to President Putin: I would like to see first on paper preconditions to be met, efforts to be taken," Macron said as quoted by Interfax-Ukraine. The essence of the plan, according to Macron, concerns the disengagement of military forces and weapons, the admission of international observers to all points and the release of hostages. Makron noted called to objectively assess the situation that will allowed mowing ahead. "We have to have an objective picture. When all heads of states agree on an objective picture, thanks to the work of our joint teams, we will be able to work out a base on which we can meet, having all the initial data." The French president pointed out that the conflict in Donbas region has been lasting a long time so it is necessary to collectively make a decision that would lead to a positive result. "I have to finalize this document in more detail and it seems to me that Chancellor Merkel (I will discuss this issue with her) will agree with this method," Macron said. The draft decisions of the "Normandy format", which can be called the "Macron formula", can become a road map for the de-occupation of Donbas, Ukrainian President Petro Poroshenko said. "I really like Mr. President approach. It is result-oriented, concrete, practical, and without much ado. Our arrangements that we yet to have to put on paper as part of Normandy format decisions, perhaps they'll be called "Macron formula", we can show them to the public as a plan for achieving peace and de-occupation of the east of Ukraine," Poroshenko said.